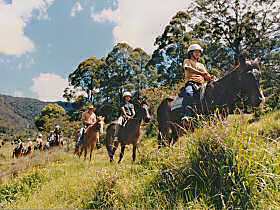 Horse riding, walking tours, bicycling tours, and bushwalking (hiking, rambling, tramping) in the Northern Rivers region, including Byron Bay, Tweed Valley NSW, and Gold Coast hinterland and backcountry, QLD, Australia. Horse riding is often available at country retreats as well as riding centres, while guided city walks, bushwalking* tours and cycling tours take advantage of the plentiful municipal parks, bikeways and World Heritage listed National Parks and reserves of the region. For birdwatchers, the walking tours will often provide a great introduction to our habitats and common species. This bioregion is known for the McPherson-Macleay overlap, which means that for birds, flora and fauna, it's the southern limit for northern species and northern limit for southern species, making it one of the most biodiverse in Australia. Gold Coast and Tweed Shire Councils have brochures showing suburban walking and bicycle ways, available at Visitor Information Centres, and Ballina Council has a number of cycleways throughout the shire. Local special interest clubs may also welcome visitors on outings. Bushwalking clubs often have biking, kayaking and paddling outings as well. * That's tramping to our Kiwi cousins, rambling to our friends in Old Blighty and hiking or trekking to everyone else!